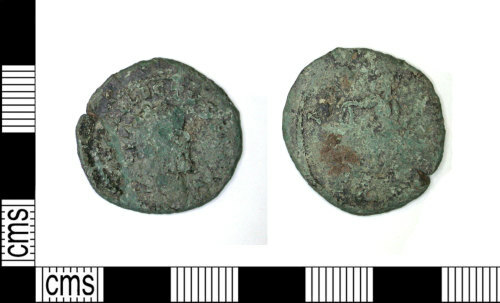 Roman copper alloy nummus of Allectus dating to the period 293-296AD (Reece period 14). Reverse type (LAETIT / LAETITIA AVG or similar), Laetitia standing left with wreath and (anchor / baton). C Mint, [S P] // C. RIC V, pt 2, p. 565, cf. nos. 76, 77 & 79. This coin has been considered for Sam Moorhead's corpus for RIC.